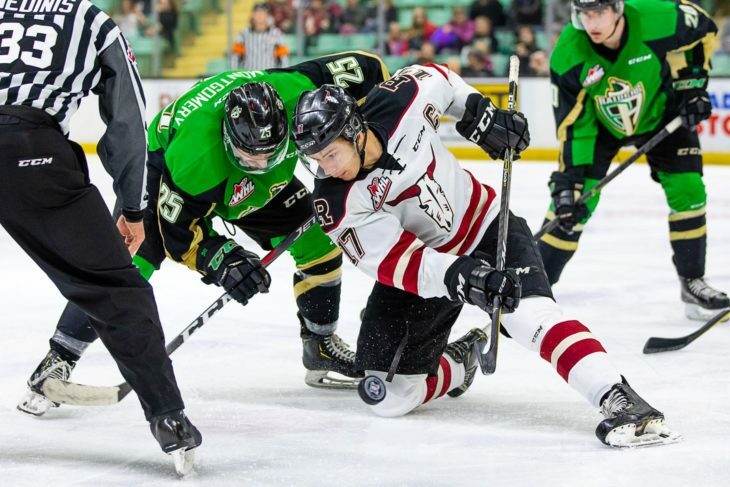 Jeff de Wit had played with four different WHL teams when the fourth season of his major junior career ended last spring, and he didn’t know if there would be a fifth as a 20-year-old with limited options. As it turned out, there wasn’t a fifth team. Instead, he returned to his original club, the organization that selected him in the first round of the 2013 WHL bantam draft. 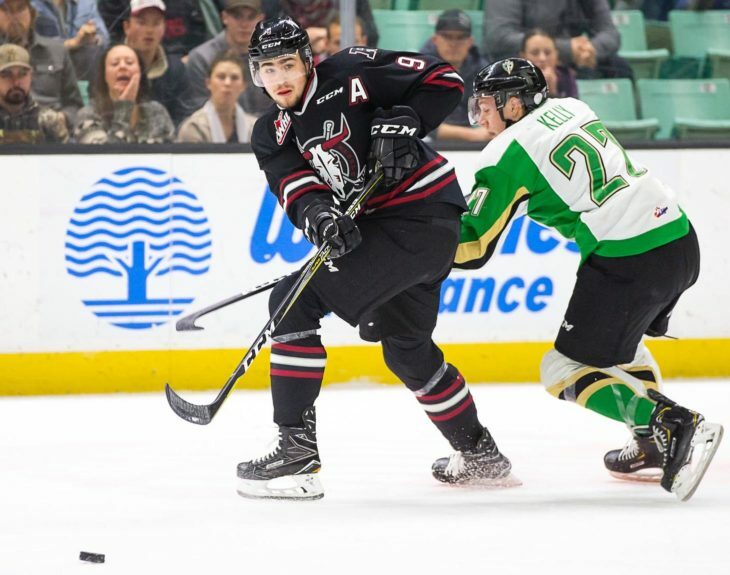 The six-foot-three, 207-pound forward met with Red Deer Rebels GM/head coach Brent Sutter early last summer and the two agreed that if de Wit got himself into playing shape, that he’d be given every opportunity to earn a spot with the team. 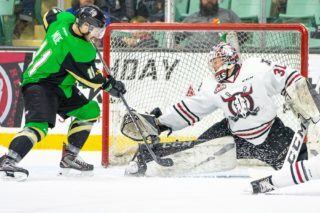 The big winger/centre played his final WHL campaign with his hometown club and enjoyed his most productive season with 27 goals and 44 points in 66 games, followed by a single goal in a first-round playoff sweep at the hands of the Prince Albert Raiders. 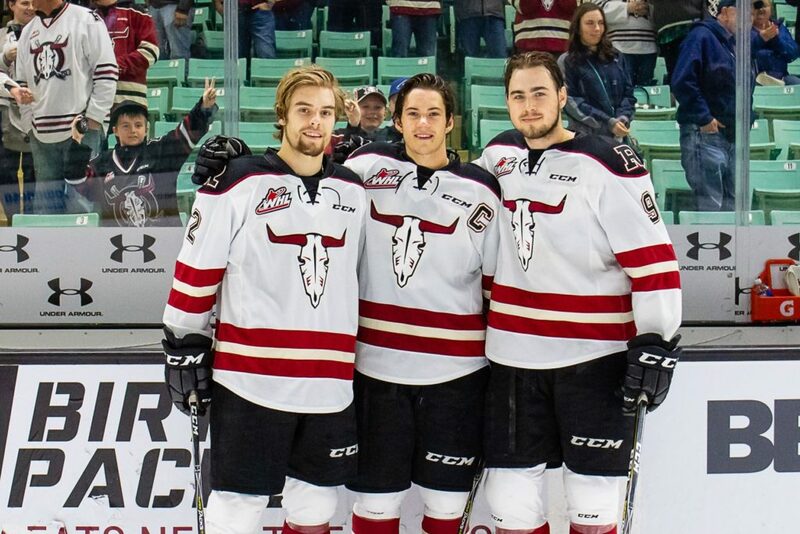 “I couldn’t have asked for a better situation than to finish off my career at home, where it started,” he said Thursday, as one of three graduating Rebels players, the others being often-time linemates Brandon Hagel and Reese Johnson. “I had my bumps along the way in this league, but it happens. It’s made me grow as a person, as a player. I can’t thank Brent enough for bringing me back for my last year. 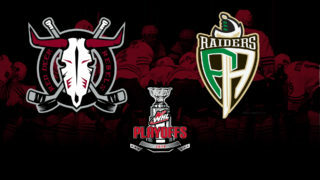 “It’s crazy, when I was playing minor hockey I never thought the WHL was even a thing that was even going to come true. When you’re 10- and 12-years-old, you think it’s such a hard league to play in, and in some ways it is. The veteran forward credited his savvy, his ability to get to the front of the opposition net and his part-time linemates for his successful season. De Wit skated alongside Hagel and Johnson on a regular basis for a good chunk of the season, with the trio scoring on a regular basis during the first two months. Hagel and Johnson parlayed their strong seasons into NHL contracts with the Chicago Blackhawks. 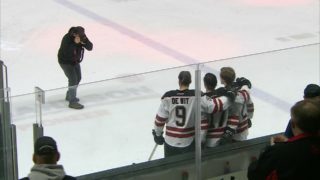 “I was pretty fortunate to play with Hages and Johnny for the majority of the season, two guys who are heading off to play in the AHL right now,” said de Wit. “It was awesome, not just because they’re two good players, but also two of my really good friends. They’ve been good friends of mine for a long time and we’re going to carry these relationships with us for the rest of our lives. As for de Wit’s immediate future, he’s likely play at a Canadian university next season if a pro offer isn’t forthcoming. Nearly one year after being rebuffed by the Buffalo Sabres, who selected him in the sixth round of the 2016 NHL entry draft, Brandon Hagel can look back at an all-star season with the Rebels. 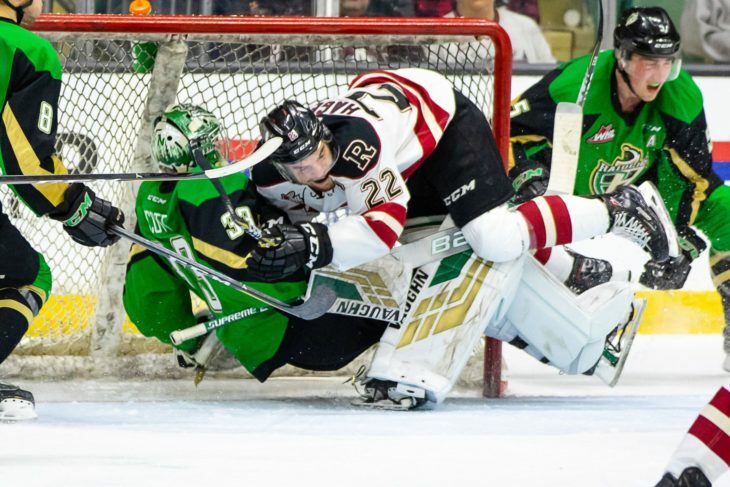 When the Sabres didn’t offer Hagel a contract, the Morinville native used it as motivation and turned in an outstanding 2018-19 season, finishing fourth in WHL scoring with 44 goals and 102 points. He roared out of the starting gate and signed a three-year, $925,000 entry-level contract with the Blackhawks six weeks later. 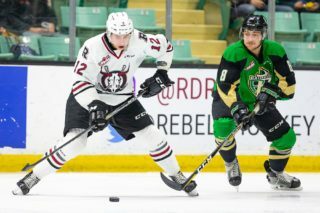 None of it would have been possible, he insisted, if he hadn’t decided to leave the junior A Whitecourt Wolves in the fall of 2015 to join the Rebels. “I learned a lot of things in Red Deer. Brent has helped me along the way, so I can’t thank him and the organization enough,” he said. “It’s been crazy. My first year in the league was really long, it felt long” he said of the Rebels’ Memorial Cup-hosting season which didn’t end until late May. 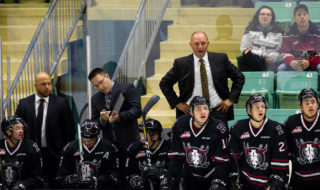 Hagel, who led the Rebels in regular-season scoring and again in the playoffs with four goals and six points in four games, would urge any and all recruits/prospects to sign with the organization if given the opportunity. “This is a place to be. They absolutely give you everything. They’ll do whatever it takes to take you to that next level, whether it’s just being an incredible athlete or going to school,” he said. “The life lessons you learn here and the way you mature in this city . . . I don’t think I would be the person I am today if I wouldn’t have been in Red Deer. Hagel’s season isn’t over, as he will board a flight to Chicago Friday morning and join the Blackhawks AHL affiliate team, the Rockford Ice Hogs. “I’m really excited. I wish I could still be playing here, but things happen and I’m on to new adventures now,” he said. Reese Johnson was a skating inspiration to the Rebels coaching staff during the 2017-18 season. The Saskatoon native made a successful return to the Rebels after two shoulder surgeries that kept him out of the lineup for half of the 2015-16 campaign and the entire following season. “Thinking back, those two years were tough times. But it definitely made me a better player, a stronger person, coming back from those injuries,” he said. Sutter didn’t wait long to name Johnson as the team captain at the conclusion of the ’17-18 season. In fact, the Rebels boss made the announcement just a week later. “Being named captain last spring was a big honour and something I take pride in,” said Johnson. “Leadership is a big thing, something I’ve always looked forward to. As the Rebels official on-ice leader, Johnson, like his graduating teammates, turned in his best-ever WHL season with 27 goals and 53 points and signed a three-year deal with the Blackhawks in early March. And now his major junior career is over and it’s on to the next level. “For the most part I’m just going to remember all the boys, I think it was a special group, one of the best in my time in Red Deer,” he said. “It’s sad that it’s over now. “I can’t say enough about Red Deer. I’ve learned a lot over the years and not just on the hockey side of it. I was just telling Brent that I think I learned more about life over the years than I did about hockey, and I learned a lot about hockey. Johnson will accompany Hagel on the flight to Chicago Friday and will also join the Ice Hogs.